Deluxe Facsimile Edition of the Partial Autograph Fair Copy in the Biblioteka Narodowa, Warsaw. The fair copy of the Concerto in F Minor, MS mus. 215 of the Biblioteka Narodowa, most probably prepared around 1835/36, constitutes the text for the solo piano version published by Breitkopf & Härtel in 1836 and, indirectly, the orchestral parts also published by them. These two texts formed the basis for the score of the 1865/66 edition. 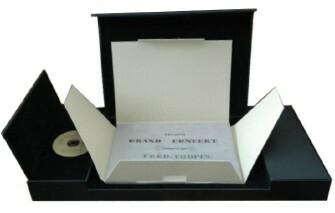 The Breitkopf edition then served as the source for the Schlesinger French edition of the solo and orchestral parts. The piano version of this French edition provided the exemplar for the English edition published by Wessel. Finally, the 1835/36 fair copy manusript together with the above-mentioned Breitkopf score of 1865/66 were the basis for the Breitkopf & Härtel score of 1879—the most popular of all and still used today. The fortune of the "original" autograph score of the Concerto in F minor following the submission to print the partial autograph remains a mystery. It was certainly held among Chopin’s papers. We do not know when Fontana (friend and publisher of the composer) produced, on the basis of this score, his reduction of mvts. II and III: certainly after 1836, and possibly many years later. Thus the partial autograph, along with the autograph of the reduction of the exposition of mvt. I of the E minor Concerto, is the last remaining authentic link in the history of the scores of Chopin’s concertos. The Concerto in F Minor Op.21 was composed between October 1829 and February 1830. Along with the Concerto in E Minor op.11 composed a few months later these two concertos are the composer's first works of significance after graduating from the Warsaw High School of Music under Jósef Elsner in July 1829. Both stand in the tradition called the "brilliant style" after prototypes by Hummel, Kalkbrenner and Ries, their solo parts characterized by virtuosity, variety of ornamental figures and a poetic chararcter of the piano cantilena. Although the Concerto in F was dedicated to Countess Delfina Potocka, the inspiration behind the Concerto, especially its second movement, was Fryderyk's youthful love for Konstancja Gładkowska, a singer of his own age making her stage debut at the Warsaw Opera. And although it is this adagio movement –"Larghetto"– that contemporary witnesses proclaimed "original" and the product of an "exceptional musical genius", the positive reception of the concerto as a whole is aptly captured by Robert Schumann's comment: "...[a concerto] which all of us put together would not be able to reach, and whose hem we can merely kiss". The F Minor Concerto's first public performance took place on 17 March 1830 in Warsaw's National Theater; but when Chopin left for Paris, concertizing along the way, he did not give a single public performance of it. Although it is clear that an original autograph existed, scholars can only speculate that either the original orchestral parts went astray or that the original score might have been so heavily marked up with alterations and corrections that it was no longer usable for performance. The precious manuscript–reproduced here in facsimile for the first time ever–shows Chopin (responsible for the piano solo part) working together with a professional copyist who provided the orchestration (a relationship possibly not unlike that of Gershwin's collaboration with Ferde Grofé). It is difficult to establish exactly the successive stages by which the two musicians prepared this score. It is certain that the copyist, having the "original" score as an exemplar, first set down the bar lines; this is confimed by the basic convergence between the layout of the lines and the density of the musical signs contained within them. As with other examples of fair copies from the period there are also traces of ‘trial runs’. The frequent, albeit minor, differences in dynamics, slurring and articulation between the autograph and copyist's part testifies to the heterogeneous origins of the fair copy score as a source document. Furthermore the copyist failed to add to the orchestra part the corrections and improvements made by Chopin in the piano part.